Aside | This entry was posted in Uncategorized and tagged acronym, bipolar disorder, depressed, depression, mania, manic, mental illness, symptoms of bipolar disorder, symptoms of manic depression. Bookmark the permalink. That’s pretty cool. 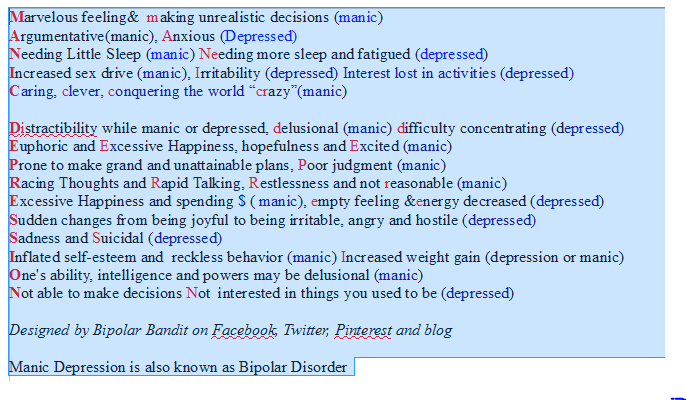 I have a number of friends who are bipolar, so I hope you don’t mind if I reblog this (with credit, of course). Nice! I’m forwarding this to my work email to use with my clients! Thanks for sharing! Pingback: Moms depressed during, after pregnancy may be more likely to have depressed kids | Depression: What about it? Pingback: Depression Studied in Menopausal Women | Depression: What about it? Pingback: Sham-Controlled Bright Light Study Shows Efficacy in Alleviating Anxiety Symptoms | Depression: What about it? Pingback: Death of Adult Son Increases Depressive Symptoms in Mothers, but Not Fathers – Science Daily (press release) | Depression: What about it? Pingback: Could Longer Maternity Leave Prevent Postpartum Depression? | Depression: What about it? 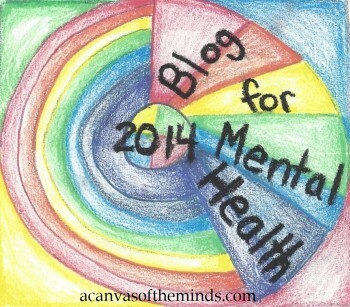 Pingback: Mind: A New Focus on Depression | Depression: What about it?